A new translation of Philo’s works into Spanish has been on its way for some years now. So far two volumes have been published, and now is also the third volume available. The volume contains 10 of Philo’s works (see here). “Dentro del proyecto de edición de las Obras Completas de Filón de Alejandría, este volumen II comprende la parte media de una de las series literarias de Filón denominada generalmente Comentario alegórico. Esta serie se inicia con los tres tratados de Alegorías de las leyes, publicados en el volumen I, y concluye con otros siete tratados, editados en el volumen III. Los diez tratados que componen el presente volumen se encadenan según el principio de la lectio continua y van del capítulo 3 al capítulo 9 del Génesis del Pentateuco según la versión de la Biblia de los Setenta. Los contenidos de cada tratado responden al juego entre la secuencia del texto bíblico comentado y los temas que se organizan en torno al texto. Estos temas pertenecen a un razonamiento general, conforme a una lectura en profundidad, es decir, alegórica. La temática alegórica aborda las figuras genesíacas desde los hermanos Caín y Abel hasta los relatos sobre el patriarca Noé. Las narraciones sobre estos personajes bíblicos son tomadas como significativas de las diversas etapas del itinerario del alma del hombre expulsado del paraíso hasta lograr la perfección del patriarca Abraham. So far I have used Bloglines as my Blog aggregator; and I especially liked their feature of gathering the blogs I subscribed to into groups. But now Bloglines are to shut down by Oct 1, and I have not yet found any comparable substitution. If there is any one out there who have any suggestions, please use the comment field below and provide both me and my readers with that needed information. My Resource Page for Philo of Alexandria has now been updated. Several dead links have been removed, and some others updated. In addition I have added references to Philo’s texts as available on the Internet and in computer programs. But I still lack URL’s to several Philo scholars. Suggestions are welcome. Several books are now being published on the Internet; some of them are first published in paper, and then digitalized and published on the net. Knut Holter & Louis C. Jonker (eds. ), Global Hermeneutics? Reflections and Consequences. SBL International Voices in Biblical Studies No 1. Society of Biblical Literature, Atlanta, Ga. 2010. Several things might be said about this publication: First it is not a publication that take full advantage of publishing on the Internet. It is not a truly digitalized WWW version as it is simply a pdf version of what otherwise looks like a printed book version. It this case this means that there are just a few (5 or 6) hyper-links in the file. Just a simple .pdf file. On the other hand, that being said, if the purpose is to make a publication assessable around the world in a speedy and cheap way this is achieved with this version too. This sems indeed to be some of the intentions behind this publication. are for most practical purposes a northern, theological enterprise. suggests, a more representatively international organisation. Testament” has survived up until today. A finnish research fellow, Sami Yli-Karjanmaa, has established his own Philo page on the Web. He is writing a dissertation on Philo of Alexandria, more specifically on Philo’s relation to the doctrine of reincarnation.The page has a few links related to his research plan, a paper presented at an international conference on rewritten Bible in August 2008: Philo on Jacob’s Ladder: Dream Interpretation or Allegory As Usual? (24 pages) and his master thesis, which dealt with Philo too (but…in Finnish). 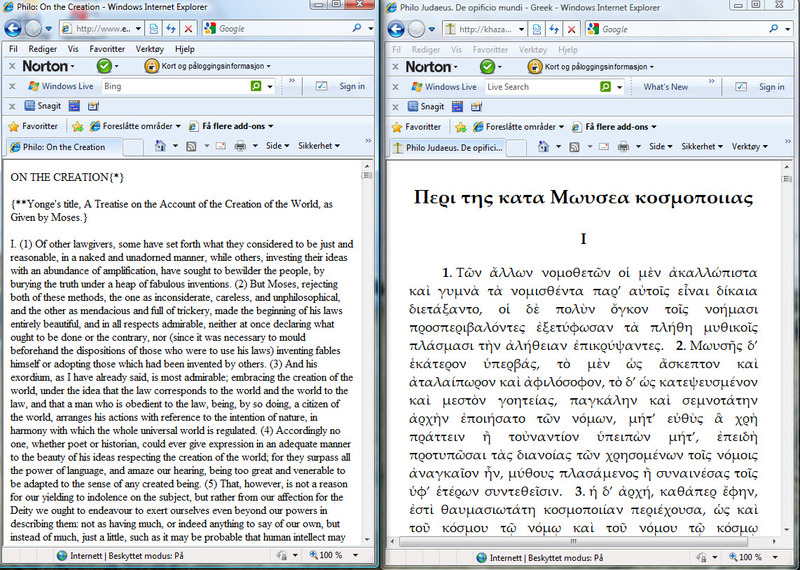 Greek Philo texts on the web! September 5, 2010 7:08 pm / 7 Comments on Greek Philo texts on the web! Several persons have said they would like to have the Greek texts of Philo’s work available on the internet. Bu so far it has not been possible. In addition to those mentioned above, Sami Yli-Karjanmaa, in a Comment, informs me that the Cohn-Wendland edition is also available at the Internet Archive.